A honeymoon in Greece sounds wonderfully romantic and it is. My husband and I chose Greece as our honeymoon destination and it was both wonderful and romantic. Besides the ancient buildings, crossroads of (ancient) civilizations, and dramatic landscapes, Greece also has many delicious local dishes that will spoil you a lot. 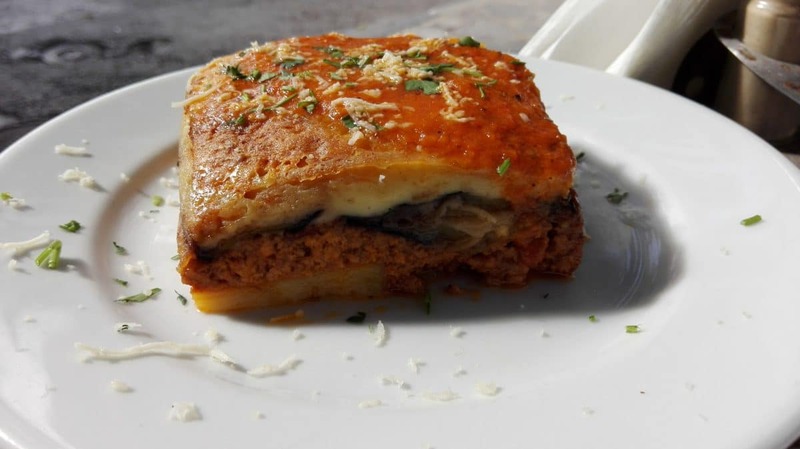 One of our favorite Greek dishes is moussaka. Once we tasted this authentic Greek food it was hard for us to resist not ordering moussaka whenever we enjoyed eating in a local restaurant. But is moussaka actually authentic Greek food? The Greeks believe that the original recipe was introduced to the Greek kitchen when the Ottoman Empire introduced their eggplant based cuisine to the Greeks when Greece was part of the Ottoman Empire. So does that mean you can find and eat moussaka also in modern day Turkey? Absolutely! But whether or not it tastes the same as in Greece is a question to be answered in one of our future travels to Turkey. At the first glance, you might think it looks like lasagna. But it’s not and it has different taste. Moussaka (μουσακάς) is an eggplant casserole based dish served together with minced meat (usually lamb) and sauce. Its consists of three layers of ingredients. The first layer is eggplant fried with olive oil, the second layer is minced meat cooked with onion, garlic, tomato, and spices, and the third layer is béchamel sauce or egg custard. To give it its gold and crusty look the three layers of ingredients are joined together to make one form and baked in the oven. After walking some hours between the ancient ruins of the Acropolis we were hungry for delicious Greek food. We found a nice Greek tavern called Cave of Acropolis (Σπηλια Της Ακροπολεως, Θρασύλλου 24, Πλάκα – Αθήνα) just across the street of the ancient and once mighty Acropolis. Once we sat down on the terrace under the Mediterranean sun we had difficulty choosing from so many authentic Greek foods. Eventually my husband went for the Greek moussaka and immediately got addicted to its rich taste. Cave of Acropolis definitely knew how to spoil us with a great moussaka recipe. After exploring the ancient site of the once mighty city state Sparta we initially intended to drive straight back to our hotel near the city of Kalamata. On the way back just outside modern Sparta we passed the beautiful old town of Mystras and decided to enjoy dinner there. Mystras offered several restaurants but we were attracted to a restaurant on the back of the town square with a small grapevine adjacent to it. This restaurant is on the right side of Mystras Inn (Mystras 23100, Greece). We definitely picked a table close by the grapevine. We were served by a young Greek man who was very helpful and patient to explain his Greek menu card to us. No English menus there. Every time we had questions he asked the restaurant chef who apparently was his mother! We decided to go for the moussaka and we definitely did not regret that! Well what is better than food made by a Greek mama? It’s too bad that we lost track of the restaurant’s name and address so we dubbed the restaurant as “Greek Mama’s place”. Once again we enjoyed a delicious moussaka and this time we were in a romantic setting with beautiful views of the mountains surrounding us. Great local food, a romantic setting, fantastic views, and a wonderful companion. What more do you need for a perfect honeymoon! On our last day staying in Greece, we went to the beach in the provincial capital city of Kalamata. Being a touristic place it wasn’t difficult to find many nice restaurants there. But we chose Alkionides (αλκυονιδες, Ναυαρίνου 125 – Καλαμάτα) as its looked so cozy and we could sit almost directly on the beach. And guess what? We ordered moussaka once more. 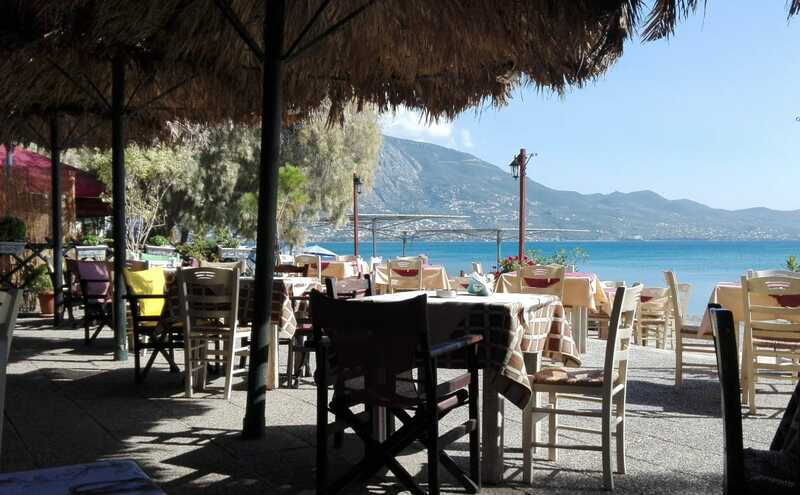 We enjoyed our last moussaka while also enjoying views of the beach and the bright blue sea, soaking up the Mediterranean sun and warm breeze. It was a perfect closure of our honeymoon adventure in Greece. Having enjoyed so many delicious helpings of moussaka was a wonderful addition to our honeymoon. It made us want to go back to Greece again and eat more traditional Greek moussaka! 5 Responses to "Food Postcard: Moussaka – A Tasteful Addition to a Wonderful Honeymoon in Greece"
Are you sure there were not layers of potatoes? This is the way we cook it in Cyprus. Hi Nel, Thank you for stop by. I realize that beside in Greece, this dish is also familiar in other countries with their own secret recipe 🙂 Thank you for sharing how Moussaka is being prepare in Cyprus. Regards, Nimas. Thank you and all the best for you too. Regards, Nimas.